Please, please, please! These books want to come and live with me. Just ask them! Oz? Alice? Alcott? Pollyanna? Fairy tales? Oh my!!! I think this is my favorite giveaway collection yet! The grandkids would love these! Keeping my fingers crossed. these are so lovely, I can't stand it! They really are so pretty. 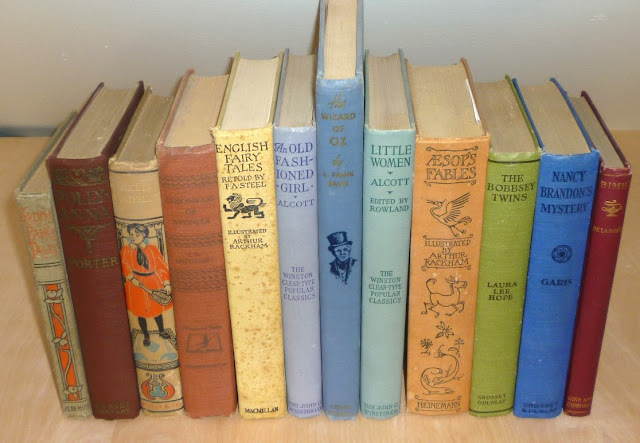 Even if I don't win I'm going out hunting for some pretties of my own tomorrow at the antique book store near me. The grandkids would love these!Got my fingers crossed. OOOOoo...I just retweeted as @FELTit, and would LOVE to have these in my collection! I would LOVE to have these in my collection! I would LOVE to win this for my kiddos. They have been enjoying the beautiful pictures in older books lately. I would LOVE to win this for my kids!! Oh, these are all favorites of mine! Fingers crossed! These are delightful!!! You always have the best giveaways. One of the best selections yet. Please enter me. Yes please, I would treasure these and read them aloud to my grandchildren. I would like to join the giveaway, please! What a lovely giveaway! I'm an English Literature student in Canada and I must say that I love your website! So many small treasures can be found in books! I love seeing the old letters and photos that you post! Amazing collection. Count me in! Wow, gorgeous books. A terrific selection, would love to have them for my family! This is so nice that you have such a fun contest. I love these books and the illustrations are wonderful! Thank you and I will keep fingers crossed for the drawing results. Old friends these books are. Books that have been opened and read by so many over the years. I would love to have them on my book shelf. How wonderful to be able to pull down an old friend, comfortable in my hands as I turn the pages and reread words that will transport me to another place. This is a beautiful collection! Would make a wonderful gift to start a little ones collection. I loved An Old Fashioned Girl when I was small. What a wonderful gift this will be for a little reader! So pretty! It's like my childhood come back to say hello. What a wonderful way to spend indoors when it turns chilly, with a rocking chair, blanket and a good light to read these with... looking forward to fall, and hoping to read these and relax! Would love them and have a warm, inviting home for them! I'd kill for that 'Wizard of Oz'. Oh, how gorgeous! Yes please! 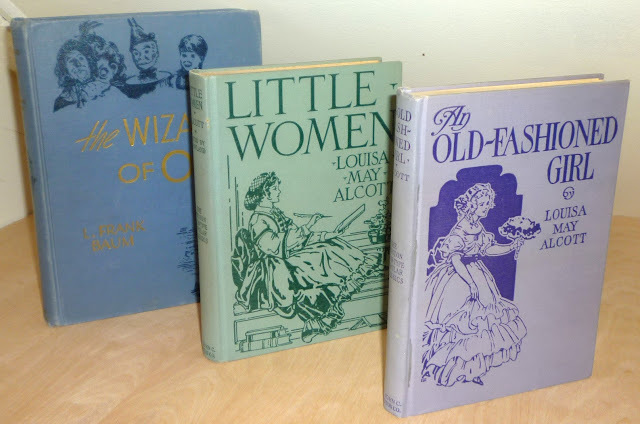 Would love these old favorites for the great grandchildren who love books. Especially my favorite, the Bobbsey Twins, as their mothers are twins! Oh please, sign me up!! Would be wonderful to share these childhood treasures with your children or grandchildren. Hi! I just discovered this site through some random Pinterest exploration, and these look like some amazing books! Consider me entered for the drawing! Beautiful! What a nice giveaway and would love to be entered. What a beautiful set of books! Thank you!! I LOVE The Wizard of Oz. Dorothy was a spunky little thing. Some of my favorite children's literature. I love them! Another great set. Good luck to all. Oh my! Those are so priceless to behold. Please do enter me to win. I would love to read these to my grandchildren one day! Please enter me - these look wonderful. an old bobbsey twin fan: pick me! My six kids would love these!